Dogs love burying their noses into the ZippyPaws Burrow Log & Chipmunks Squeaky Hide and Seek Plush Dog Toy, for hours of entertainment. Simply hide one, two or all three of the included squeaky chipmunks in the log, and this interactive plush toy will challenge your dog as he works to dig them out. 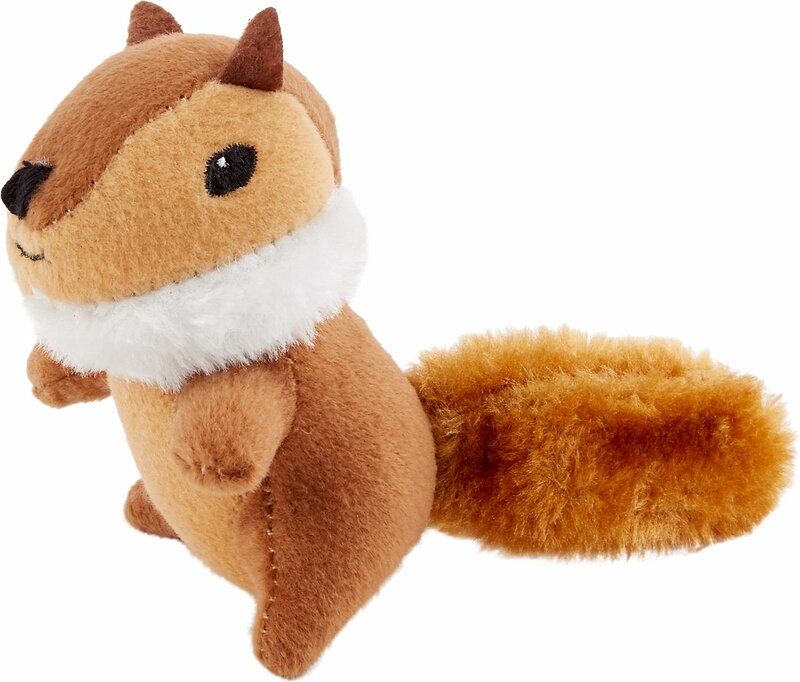 And for even more fun, you can purchase the squeaky chipmunks on their own. This toy is great for medium and large dogs, but not suited for aggressive chewers. And it’s machine washable, making cleaning a breeze. Fun and interactive puzzle toy challenges your dog. Comes with three cute and squeaky chipmunk toys. 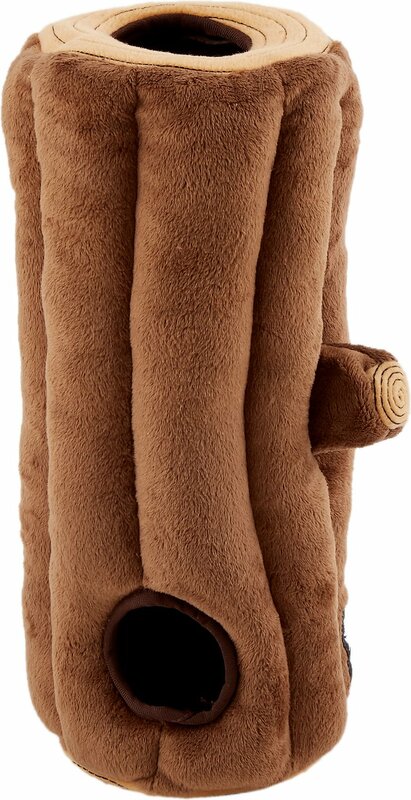 It’s machine washable, making cleaning a breeze! Our 6 year old Australian Shepherd LOVES this toy. As her favorite toys are Frisbees I wasn't sure how this toy would go over. She loves pulling the chipmunks out but also carries the log around empty and tossed it into the air. I'm going to order more chipmunks so I can stuff as many as possible in the log. One of our chipmunks squeaker was broken when it arrived but she still plays with it. If your dog destroys soft toys this isn't a recommended toy as it won't last long. 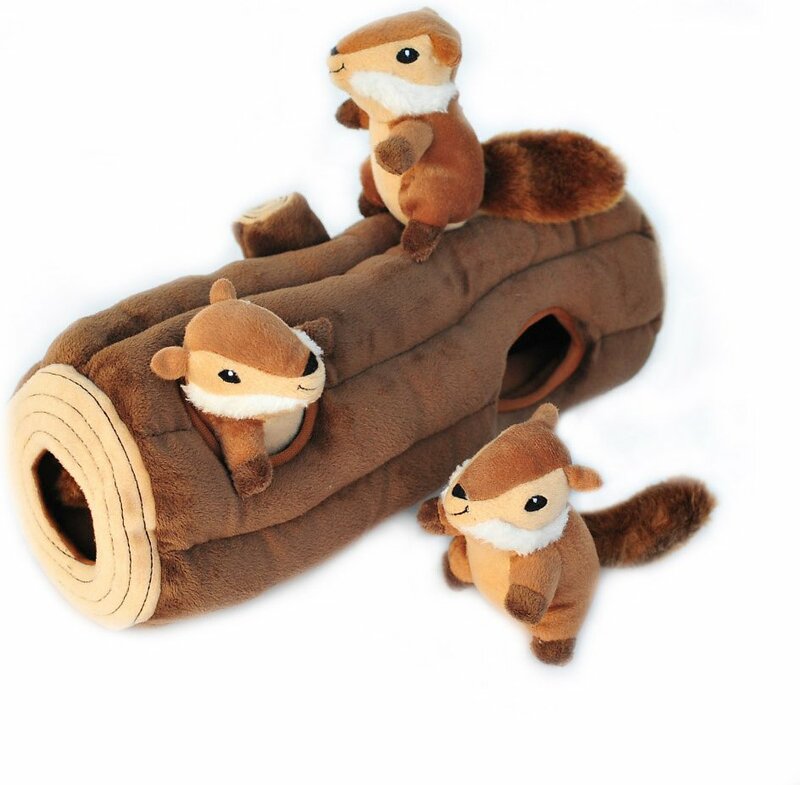 I have two dogs that are in constant need of new stimuli and found this cute squirrels in the log toy. Not only is it adorable but my dogs have decided they like it enough to not destroy it immediately. It’s a bit smaller than expected and is fairly durable, both pups like to stick their noses inside the log to hunt for squirrels and sometimes they even heard them. I’m pleased with it so far and I believe that extra squirrels can be purchased separately in the event one doesn’t survive the hunt. Both my puppy and larger dog love this thing! They love sticking their noses in the holes to try and find and pull out the chipmunks! The log itself seems durable so far but the chipmunks don’t seem as durable; granted it was the teething Australian Shepherd puppy (not the 4 year old husky/cattle dog mix) that ripped into the chipmunks to expose some stuffing. I say it’s a great “brain” toy for all pups and dogs! 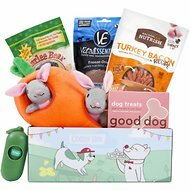 Our miniature schnauzer loves to burrow - this toy is perfect for him! He loves the log itself almost as much as the chipmunks! He has had it for a little less than a month now and has chewed it, thrashed it, pounced on it, etc., and it's holding up well. The string on one of the chipmunks' noses unraveled, but it was a quick snip and good as new (with the amount he plays with it, I'm surprised he hasn't done more damage.) This is a nice size for smaller-medium dogs. I highly recommend. I can't tell you how much fun the dog has with this toy. I can also tell you that the cat likes it to. The dog plays with it more than anything else she has. I will have to get more chipmunks soon. I have had to replace the squirrel tree, from the same maker, I have for her already. Border Collie pup LOVES this! Our 4 mo. old border collie loves this toy!! He pulls out the squirrels one by one, then tries to corral them all together!! Sure, of course it’s not going to last forever, especially with a chew-happy pup, but we’ve already ordered more squirrels, and it’s affordable enough to replace them! We’re enjoying watching him play, perhaps as much as him! This was the first toy out of many that we bought for our puppy in the last eight weeks. It was the first for him to destroy. Which was a bummer because he really liked it but when you see the stuffing start to fly it’s gotta go. I was so excited about giving this to my dog Annabelle. However, I know its difficult to keep any cloth toy for her, I forgot the trunk was fair game as well. I would have given it 5 stars if the base was made of sturdier material. The little squirrels didn't last long (RIP little guys). But their skins are still around (which i was expecting). The trunk is still usable but its definitely seen better days. I would recommend this toy since she did have a blast. She is a 5 year old blue pit, about 75 lbs (for reference). I've never had this much fun just watching my 2 dogs play with this. Almost as much fun as them watching me stuff the little chipmunks back into the log. Amazing someone really came up with the best fun fie a fog ever. My 2-year-old Springerdoodle just loves this toy. She runs through the house with the log, then jams her face in the openings to retrieve the chipmunks. She squeaks these things and throws them in the air. This toy is very durable as my pup has a habit of chewing out the squeakers but has not even tried. She brings me the log after the critters are out, I stuff them back in and off she goes again. Great fun.